The island jungle nation of Rhegeni considers itself neutral in the affairs of the world, but they also consider the greater nations quite capable of stomping on their neutrality. The island chain of Ehin Moure offers an attractive outpost to Zenevas or Helic, and a welcome addition to any of their neighboring nations and tribes. 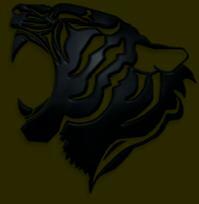 For centuries the Zi tigers that have survived there have inspired the minds of military designers, and are thought to have been a major influence on the construction of the first EPZ-003 Saber. But it was the recovery of an ancient Gul Tiger carcass that finally moved the Rhegeni engineers into action. 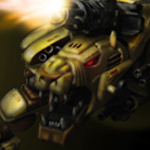 The Siobhan was actually the sixth Rhegeni tiger Zoid but improvements elevated it to the first of the new Lioness class, named to honor the tribal matriarch who now rules after her elder brother was killed in a border dispute battle with a nomadic tribe. The primary defense system of the Siobhan is stealth. It has SEM coated armor and emission filtration systems built into all vents and heat sinks, acoustic dampened power plant and joint casings, low ambient return paint where possible, and active ECM systems to confound incoming sensory sweeps. While appearing as a Dark Zoid due to its reverse engineering, it lacks the strength of the Dark Armor worn by its predecessor. Instead, it dons layers of lightweight composites that help in distributing kinetic and energy damage. When all else fails, dodge. The high agility of the Siobhan allows it some very deft maneuvering that can help keep it alive. 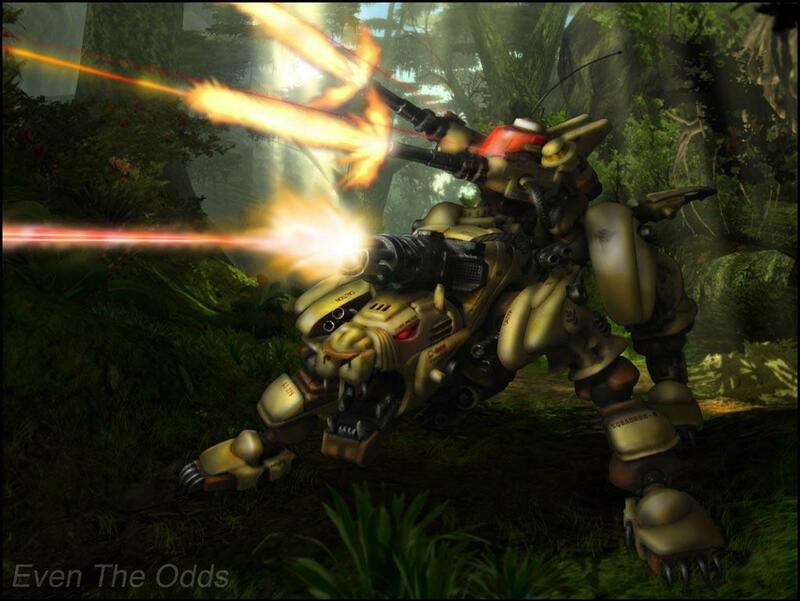 While most feline Zoids are built primarily for speed and secondarily for their melee power, the Siobhan, like the Gul Tiger it is based on, is designed primarily for stealth and secondarily for firepower. It is specially skinned and jointed to prowl the dense jungle islands of Ehin Moure like a deadly shadow, but could also do well in more level terrains. In the open it can achieve speeds of 190 KPH, though it seldom exceeds 60 KPH in its home environment. With the addition of eight core-tap booster engines, it can sprint up to 260 kph for up to a minute. It is an excellent climber and, unlike most feline Zoids, an accomplished swimmer, able to sustain 20 knots. The Siobhan’s sensory system is very good, able to track other Zoids as far away as 110 kilometers through heavy forest, but it excels at closer range maneuvers within 5 kilometers of targets. Having a manned turret allows the Siobhan to tackle targets of opportunity while seeking the primary objective itself. By using precise aiming and heavy projectiles, the Siobhan can snipe many light to mid-weight targets with short bursts from its triple Gatling cannons, then slip away into the jungle for the next hunt. However, the XZ-279 is limited by its ammunition load. There is a variant in the works that replaces the self-contained projectile cannons with intensified lasers in an effort to extend field duty cycles, but energy and heat signatures could compromise the stealthy nature of the Siobahn. One of the keys to the Siobhan’s operational efficiency is its turret mounted twin CCS-3b-50 self-contained Gatling cannon system. The pilot merely needs to mark his target’s signature and prowl about the landscape while the cannons track the target independently. They can be either triggered by the pilot, by the Siobhan, or be commanded to fire on opportunity. Also, they can fire anywhere from a single round or single burst of 30 rounds to a continuous 1,200 RPM rain of bullets that will cease when sensors indicate a kill. With a drum of only 600 rounds per gun some pilots disable tandem firing to extend ammunition. The CCS-3b-50 system, in short, allows the Siobhan to engage targets in any direction and deliver heavy to moderate damage at 2 kilometers. This cannon is larger by far than its turret mounted cousins, yet with a 20% smaller bore. On the other hand, it also carries a staggering 4,000 RPM rate of fire and a vertically mounted magazine holding 2,000 rounds of HAPEX (Hypervelocity Armor Piercing Explosive) rounds. The cannon is unique in that it has rounds with a vibro-penetrator core that is activated and charged as each leaves the chamber. This penetrator superheats to 9,000° by impact, melting through moderate armor like butter and passing through armored canopies without resistance. It also ensures that the round only explodes deep with the target rather than on the skin. This system has an effective range of 1.5 kilometers with quite good accuracy to 1 kilometer, achieving 80% of rounds within a 3-meter grouping. Early in its development it was clear that the Siobhan would have an energy based weapon to extend its ammunition and battlefield life. The "Lewis" (Laser Weapon System) 15a was developed as a backup weapon for this purpose. It is larger than it appears; the muzzle of the gun is seen in the mouth of the Siobhan but it is actually mounted within neck with further systems as far back as the torso. It fires a powerful pulse or a continuous beam, but the nature of the Siobhan as a hit and run unit usually requires the former. The LWS-15a-80 has the potential of extending the Siobhan’s effective range beyond 2 kilometers. Added to the newest generation of Siobhan (the XZ-279-C), this system is comprised of a pair of compact 128mm cannons that use a portion of discharge energy to accelerate the recharge and fire rate of the other gun. In short, it fires 20% faster than a single weapon, allowing it to compound the damage it delivers for short bursts. The heat the RCS-9a1 produces limits it to bursts up to 4 seconds with a lengthy cooling period between, but its effectiveness against targets up to 3 kilometers away and its lack of reliance on ammunition balances its shortcomings. Designed to pierce heavy armor with a sustained stream of condensed photons at ranges up to 5 kilometers, the LBC acts as both rearward sniper cannon and a close-in energy blade. The pilot can choose between the lasting blast to saw through more durable opponents or can cycle several shorter shots at one or more lightly armored foes. It was the original energy based carried by the Siobhan, intended to extend the ammunition of the CCS-3b-50 Gatlings. Two additional weapons were built under the chassis in the read arc in models using primerily projectile weapons, but these lack the blade feature innate in the tail cannon. Designed primarily as an active defense system, the Twin Fist can also be loaded with offensive rounds. One unit is mounted atop each shoulder above the booster cowling affording a 180° lateral arc and one is mounted on the inside of the forward armor protrusion with a 180° vertical arc. Combined with shoulder actuation, all launchers actually have a much wider field of fire. Offensive canisters include CALM (Clustered Anti Light-armor Munition), “Broadshot” APR (Anti-Personnel Round), CISPR (“Crisper”; Close-In Sabot Penetrating Round), “Cinder” incendiary round, ReaPeR (Reactionary Plasma Round), and SSR (System-Shock Round). 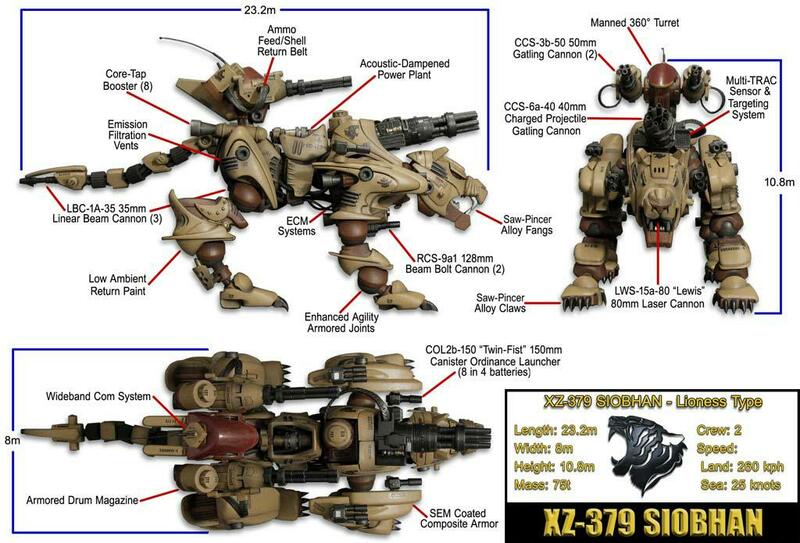 Ranges vary from 100 meters to 500 meters with effects suitable for targeting light armor, foot troops, or environment, with ReaPeR rounds deploying super-heated plasma that vaporizes soft components and melts armor on impact, and SSR rounds that effectively work like a Zoid-scale tazer, shorting out less insulated electronic systems on large Zoids and even a 25% of killing smaller units outright. The XZ-279 has a greatly improved bite over the DPZ-16 Gul Tiger; the maw is 50% longer with a 100% increase in aperture. The hardened alloy fangs are micro-serrated with manufactured diamond blades to pierce through armor at least as efficiently as the largest feline Zoids, but new bladed molars both crush and slice heavier armors to ribbons that often defy pierce-only bites. The Siobhan’s claws extend 25% farther than its Guylos counterpart, and their cutting efficiency has been doubled thanks to the same diamond-based micro-serration technology that benefits the fangs. These claws can draw into their housing allowing the Siobhan to “pad” more stealthily. Half stalking nightmare, half ripping terror, the Siobhan is a cold and calculated hunter that know how and when to strike. Unlike many predatory Zoids, the Siobahn does not seem to have a blind spot. It uses reservation and brutality in perfect balance, scheming with its commander and working in unison with its gunner. With this mind in the original Gul Tiger body, history could have been very different. Rhegeni is a nation of islands with limited resources, and they have worked exceptionally hard to develop a Zoid that can maximize every ounce of metal, every circuit, every round of ammunition and every pilot. The XZ-279 Siobhan has shown itself to be that machine. What it could be the precursor to is a frightening thought. It integrates well with the only other significant Rhegani Zoid, the XZ-109 Askari. Together the threat of the lighter maneuverability of multiple Askari and the stealthy power of the Siobhan have kept would-be invaders at bay for over a decade. I have wanted to do a custom of the Gul Tiger for some time. When Shevon, my fiancée at the time, showed a great interest in Zoids (she is a modeler and figure painter herself) and her favorite animal is a Tiger, I decided to build her a birthday present! I wanted to go with a Gul Tiger for her custom because it is unique in Zoid cat design; it’s the only big cat that is prowling rather than standing bolt upright. I wanted to make this custom built for prowling and close-in combat, so rather than heavy, long range weapon systems I went with something that was also a favorite of hers; Gatling guns. So, you can see the original corpse... um, chassis... is a little incomplete. No CPC, no hip guns, no tail gun, and no TAIL. That would be interesting to replace, but I had some ideas. But there were a few tougher obstacles to overcome; the Tiger was shipped with a missing cockpit and had a broken cheek guard, which essentially leaves the head incomplete (and rather skeletal looking). The Gul Tiger I bought on eBay was in... slightly worse shape than anticipated. To even get the Zoid to square one would require major surgery. I decided that the missing parts would work to my favor in rebuilding a new design. I had won the One Blox CP-03 Gatling in a contest, and decided it would be a good item to customize for this build; it would fit neatly into the original CPC socket with little modification. The barrels were cut out from between the base unit and the end piece and were refitted into a pair of triple-barrel cannons. Now I had a plan for a Gul Tiger with three Gatling cannons! Funny, isn't it, how the simplest plans often go astray? The last image above is my digital concept... the ZX-278 Gatling Tiger. After chopping the chassis into strips I had to cap off and close each segment. I used HO siding styrene card to create the look of slatted vents. These were placed at all open ends of the segments, and they were cut or drilled to allow the Struxx joints to pass through. The card also served as internal support structures to give strength to the tangle of joints. In the third image above you see the midsection segment; slots are cut in the vents for the ball joints to pass through, then the "C" shaped piece is slipped in to smoothly close the vent panel around it. The last picture shows the criss-crossing Struxx inside the chest cavity. Four joints were required for waist, shoulders, and neck, and each was mounted at a different height due to both the design of the original mold and the desired look of the final model. The shoulder pieces actually interlock with tongue and groove, then I practically filled the cavity with Loctite Stik-n-Seal for strength. My first challenge with the head was the missing left cheek piece; without that, there is a huge, gaping hole showing the understructure. I thought about building the piece over again, but I wanted to improve on the design. And there was the second problem of the missing pilot seat and eyes. The solution I campe up with was to use the head of a Robostrux Kreep in the fashon we see the head of the HMM Red Horn; an clamshell cockpit inside an existing head. In the end, the lower half of the clamshell worked well for the pilot station and supported the head armor atop the old chassis, now supporting a new lower jaw structure. A Struxx joint was fitted to make a neck and the post was drilled out to form a cannon. I made entirely new cheek guards from styrene card to close the gaps on either side of the head, discarding entirely the bright orange bits. The first thing I knew I wanted to do was to joint the build as completely as possible. I knew that this Gul would never walk again, so I menally threw out all the mechanics and though about what ways I could make the body move, not just the legs. A single joint at the waist wouldn't suffice (it looked tacky!) but if I doubled the waste we could have something. There was also the minor matter of working around a complicated internal mold that used to hold all of the gears; you can't just clip it anywhere and have it look right. I also wanted the head to swivle, but that ended up being a real challenge... Gul Tiger is the only feline Zoid model that has NO NECK! The chassis continues from hip to jaw. I had aquired a box of Struxx toys solely for the large, solid ball and socket joints. The size worked better than any product I have seen, but they are all too tight, so each one had to be Dremmilled out and loosened. In the end, the new cockpit looks better to me than the old one. After these shots I added clear red deodorant cap plastic for eye lenses and cut some new teeth for Siobhan. Molars were added after this final shot as well, helping to fill out the now vacant original jaw. The final result is exactly what I was hoping for; more tiger... less weasel. Here you can see the "spine" of the Siobhan; a pair of Struxx cut to fit back to back inside the slim midsection armor box. Further, the ball joint at the back of the chest segment was slotted to fit with the post of the socket for the neck. The trouble was that the Gul Tiger "slinks", unlike all other feline Zoids, and the neck is much lower than the waist. This arrangement ended up as a requirement, however, in order to joint the shoulders. The second image shows the first fitting of the segment armor after the waist joint was complete. Now I had some real direction to work with, and some real challenges. Replacing the pegs and holels for the legs with large ball joints was going to be very, very tricky. 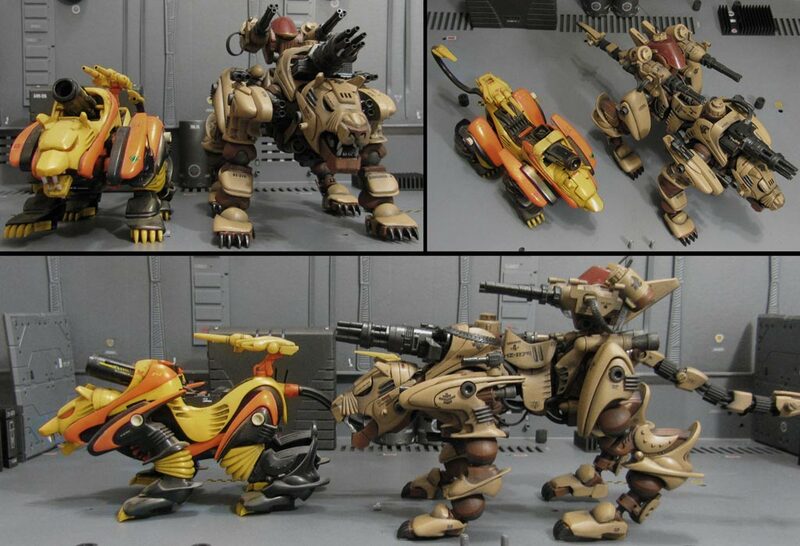 Unlike other kitty Zoids, you can't just cut Gul Tiger legs apart and stick joints in them. The original molds are HORRIBLE for this! Each leg is a single, odd shape to begin with, they are also completely hollow, and they have strange structures inside. The first challenge is finding the joints (especially the ankles, which don't exist at all), and cutting the legs apart. Then the Struxx sockets have to be shaped, loosened, then overglued in place. Once the legs were jointed I wanted to make every part of Siobhan solid, so all parts of the legs and feet were backed with styrene card. Rather than just making flat, smooth pieces to fill in the back, I built them up and sculpted layers, armor lines, and other details all around. The rear ankles were made from Asobloks rather than Struxx because the later looked far too bulky. Now appearing too thin, I used the techniques I learned creating the Askari and built a set of metal hydraulics for the gastrocnemius (musculature/tendons from the hind ankle up the rear of the leg) I then took a portion of rounded plastic from a soft soap dispenser, drilled ventillation holes through it, and suspended an armored shield over the hydraulics. The original plan for this gun was to use the standard CP-15 Gatling Booster cannon, but I won the Neo-Blox Hilbit Gatling in a contest and decided to use it instead. I cut the barrels down to use on the turret weapons and modified the main gun to fit in the cavity in the Gul's hump. It fit like a glove with almost no modification, making a very effective new main gun. I wanted it to be a belt-fed monster rather than some kind of energy weapon, so I bought a flat stainless steel necklace at a thrift store for use as an ammunition belt. This required a drum of ammo, so I took a soft soap dispenser and cut it down to fit over the old Grade-Up port (now devoid of mechanical parts). I placed the Gatling's end cap over the drum and glued the magazine in place; the chain had to be twisted a bit but it fed perfectly into the breach, which was formerly the off-center mounting post for the gun. All but invisible to the viewer lacking a good flashlight are the details in the turret ventillation system. I took a pair of Gundam boosters and fitted some gold foil cut from my electric shaver into the slots, creating some wonderfully detailed grills. Beneath the foil I trimmed more of the deodorant cap to make a lense (because, well, you never know... maybe I would light it up someday or something). You really can't see this detail at all without a good flashlight, but it's nice to know that it's there. The semi-completed turret; guns in place, canopy in place, cooling system in place. At this point I added the caps as details on the front of the ammo drums, the sighting systems, and sliced two sizes of caps to slip around the base of the gun barrels for detail and to add strength. After these shots I added a Seismosaurus gun mount to link the turret to the back, and the communications gear to the top of the canopy. Okay, I only had two kinds of tails available for this build, and I didn't like the look of either. The spare Liger tail is just a tube of plastic, which I have never liked, and the Savinga tail was better in design but by the time the new jointed body was taking shape it was oh, so obviously too small. My solution was to extend the Savinga tail. I cut it into its component bits and cropped out the sections between the armor plates. Again, due to some internal strucures this was harder than I thought it would be. I decided a cool way to extend the tail and make it look great was to make it appear as a bundle of heavy cables wrapped by bands of armor. The core of the tail is a thick necklace chain, but that offered zero support. Further, because of the sockets in the pieces, the chain couldn't be continuous, so I had to cut it in two. There are two thin insulated wires that run from the base of the tail, down its length, then around the tip and back. These gave it more substance and support, but it was still floppy. In the end, I had to insert a thin alluminum rod within each wire bundle so it had support and could still flex. Originally I added a large Struxx bit to the end for a cannon and glued a pen cap clip over it for a piece of armor, but there was an... incident... when I attempted to add some details to the gun and I ended up scrapping it. The new gun is from a Genosaurer, and I think it looks sleeker and better than the bulky original weapon. The tail was the least portion of a rather intense cabling regimen I had in mind. To bulk up the midsection and keep it flexible, I wanted to run cables all around the joints. On each side of the Siobhan three cables run from the chest to the hips, and another two cables run from the shoulders to the waist. The lowest side cable that runs under the waist armor segment is threaded through a steel ring I secured there to support it and give it a more dramatic drape. I added a central cable from chest-mounted double cannon for a total of 11 necklace chains for the torso. Four more cables run from the head through the neck armor and into the large intake at the front of the chest. The main Gatling, of course, uses another chain for the ammo feeed belt. At this stage I could finally build the Siobhan to check for fit and finish, and to compare it to the original Gul Tiger from wence it came. It is more than 10% larger in every aspect, just in the body alone, but the turret and the ability to extend the legs make it look almost 50% larger. I added the small guns from two Elephander kits and trimmed them down to use them as cannister-based countermeasure systems. One thing I planned but did not impliment was to add hinges to the rear orange leg armor and have the cannisters exposed by popping up out of the hips. While I could still add the feature, the new legs look smaller when they extend and I thought adding weapons within them seemed... well, too far fetched. I love the Gul Tiger's unique style. But let's face it, it has the head of a weasle or a mongoose, not a cat! Even with my rebuilt, larger version, it wasn't very tiger like. I studied some tiger photos and decided to build up a new noggin. I used Asobloks to make all new cheeks and extend the jaw to a real, robust chin, broadening and strengthening it with styrene card. I used pieces from the old Gul's knee joints to make the folds in front of the eyes and add size and strength to the skull; it looked like it was scowling now. The end of Genosaurer's triple cannon became the bridge of a new nose, with the tip being made of styrene card. I also took the old clamshell cockpit cover and cut it up, using the sides for the jowels and placing the top on Siobhan's head to pay homage to the original Zenebas design and add some bulk there to balance the new size out. Here are the first pictures I took with the jointed legs in place; I was pretty pleased with the width and height, but in some positions they can look a bit awkward. The rear legs aren't very clean as far as mimicking actual biology, but I figure it would take using at least two Gul Tigers to cut them apart and rebuild them to more accurately resemble the mold. The final picture shows a few other improvments I made to the feet, which were in a sorry state due to the original mold (there is no instep to the feet, the tops are sawed open, the backs over the heels are broken away). I used styrene card to enclose the feet and shaped it to compliment the armor on the finished side, then placed part of a Struxx socket on top as an ankle guard to add a look of girth and strength. Finally, I extended the toes out of the armor and sharpened the claws, sanding them into a more hooked shape as well. Even after priming Siobhan's waistline just seemed too skinny, like the HMM Saber but more extreme. The chest and head had both increased almost 50% in size, and the hips were made larger with boosters as well. I decided to create a "cap" to add some size to the midsection. It was a natural place for the addition, making the belly look taught and creating an implied line from the hips to the shoulders. The piece is an Arosaurer intake cowl with a turbine/hydraulic mounted through the center. This was made from the leftover pieces of the Grade-Up port. It plugs into the last scrap of the Genosaurer's triple cannon (the main barrel of which is mounted under the tail tip). Looped beneath the cam is a necklace cable that passes through a small spring from a video cassette. The assembly can be mounted atop the midsection segment or removed at will. In addition to its passive defenses, the XZ-279 also carries four batteries of “Twin-Fist” two canister ordinance and countermeasures launchers. As a defense system these can deploy a number of canister-based rounds; smokescreen, flare, chaff, or “Guiderail” ECM pods, micromine clustered anti-personnel minefield deployment rounds, and STAR (Sensory Targeting And Reconnaissance) sensor pods that act as remote detection equipment and assist in target triangulation for the Siobhan or allied artillery. A standard defense load usually includes 1 each smoke, flare, chaff, and ECM. One aspect of this custom that was a big step in my career was the inclusion of custom designed water slide decals. I have made custom labels before, but not decals, and I had never used slide decals on a Zoid. I designed them with some... depressing amount of detail. There are labels the size of pin head such as the icons I created for antennas and power grounds. There are labels less than half a centimeter across with detailed instructions on which tools to use for panel access, and ammo magazine labels narrower than my thumbnail that detail the serial number, class, caliber, and number of rounds. Incidentally, the Siobahn's pilot is Liutenant Commander Anna Reige and the gunner is Liutenant Thomas Row.